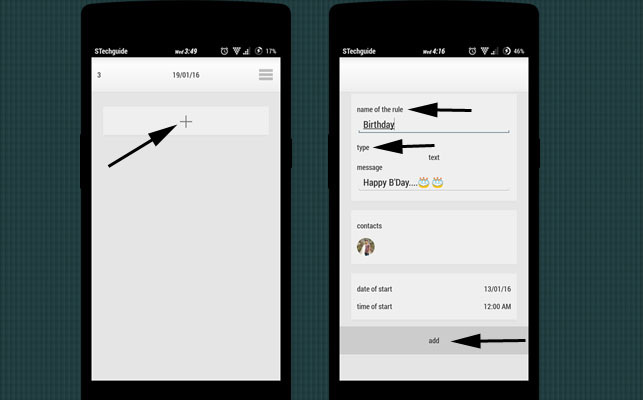 Today we discuss how to schedule Whatsapp messages on Android Phones. WhatsApp is the most popular instant messaging service that let you exchange messages, pictures and videos for free through the internet. Almost everyone who has smartphone and internet connection uses WhatsApp. It sync’s with your contact list and adds all contacts who has WhatsApp installed in their phone. With WhatsApp, you can always be in touch with your family and friends from all over the world. 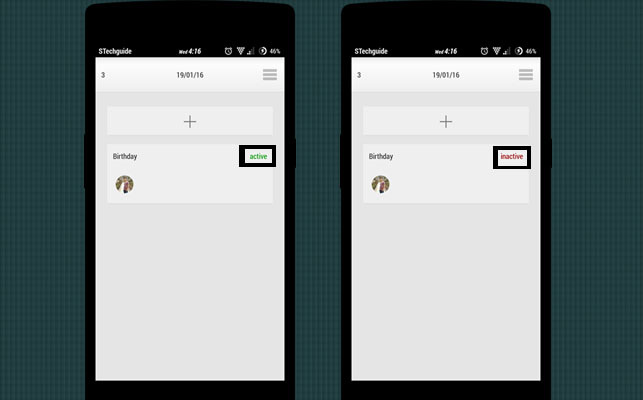 You can quickly send a message to someone with WhatsApp but what if you want to send someone a message at a specific time like to remind someone of a meeting at a particular time or if you want to wish someone her/his birthday at late night. For that, you have two options either you can remember every event and wait for the time, or you can easily schedule WhatsApp messages, set specific time and WhatsApp will send that message at that particular time. 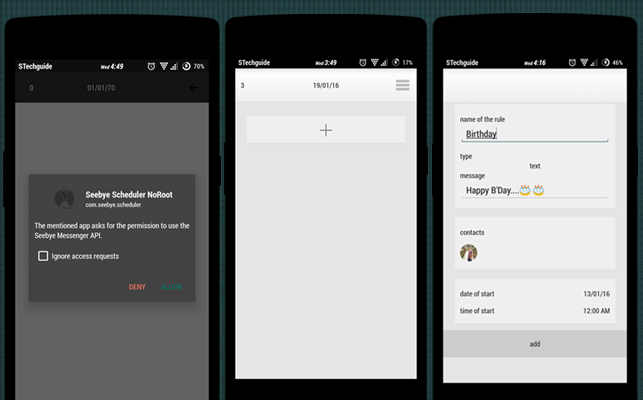 Today we discuss how to schedule Whatsapp messages on android phone no matter your phone is Rooted or Not. This app requires an internet connection at the time message scheduled. So make sure your internet is working at that time. 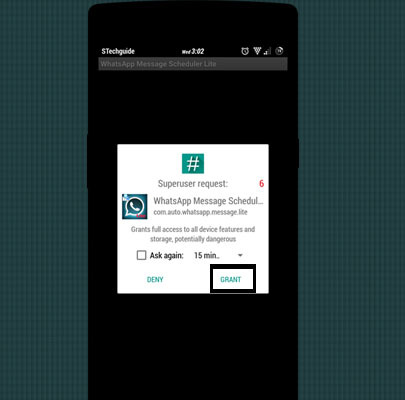 You need a Rooted phone, or Messanger API installed on your phone. Make sure you don’t Greenify or any task killer to kill these apps. This app requires to running in the background so you can’t kill them. 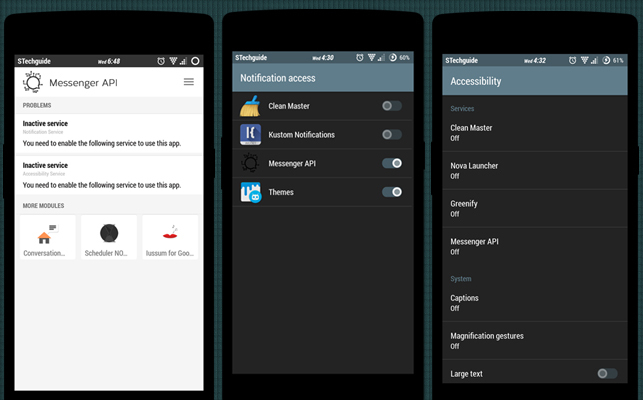 First install the Messenger API BETA and Scheduler NO ROOT from play store. Open Messenger API and click on ‘Inactive service’ and enable ‘Messenger API’ now go back and again select ‘Inactive service’ and ‘on’ the Messenger API. 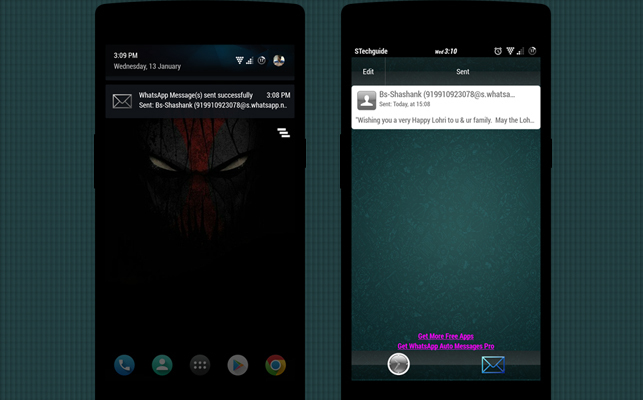 Now you can sync the Profile images and latest messages of your contact or move to the next screen. 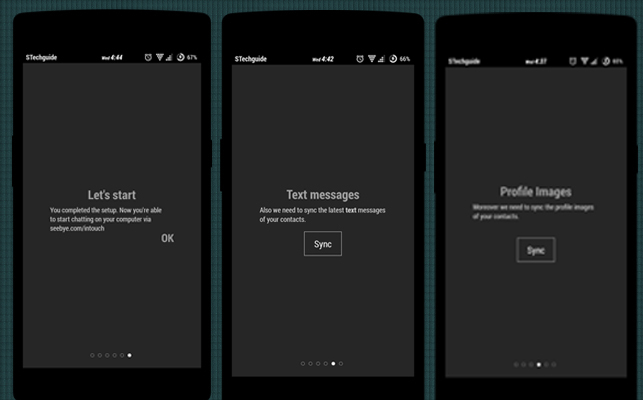 Now complete the setup and close the Messenger API. Now open seebye scheduler No ROOT and skip the tutorial. A popup menu prompt that ask your permission to use the Seebye Messanger API allow it and click ‘LOGIN’. Click on ‘+’ button to schedule your first message. Now enter anything in the ‘name of rule’. Now choose your message type ‘image, sound or text’ and enter your message or select a picture to send. Now select the Contact whom you want to send a message. All your contacts already synced you just need to choose them. Finally, you have to Schedule the date and time. You can also set the frequency of your message hourly, daily, weekly, monthly or yearly. Now you can see your rule name and a text ‘active’ or ‘inactive’. Active meant your message set and scheduled and inactive means either it is disabled. These apps need a Rooted device. You can check how to root your phone with one click. Take Backup of your data before rooting your phone. 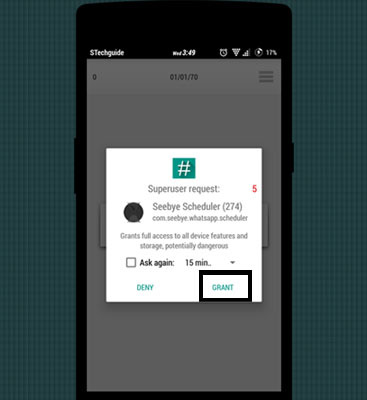 Download and install Seebye Scheduler ROOT from the link above on your Android device. Open the App and it will ask you for root access, grant it. Click on ‘LOGIN’ button and it will open the main screen you don’t need to register or anything. Now enter anything in the ‘name of rule’. Now choose your message type image or text and enter your message or select a picture to send. Now select Contact whom you want to send a message. All your contacts already synced you just need to select them. Now you can see your rule name and a text ‘active’ or ‘inactive’. Active means your message set and scheduled and inactive means either it is disabled. 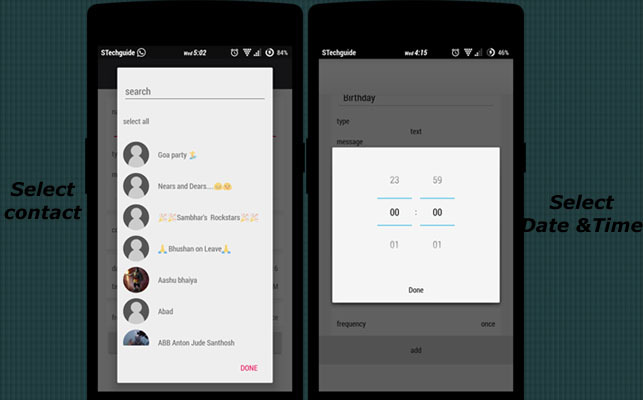 That’s all, setup the app correctly and you can schedule WhatsApp messages easily. I recommended Seebye Scheduler Root over this because in that you can send sound and image also. Use this above not works for you. 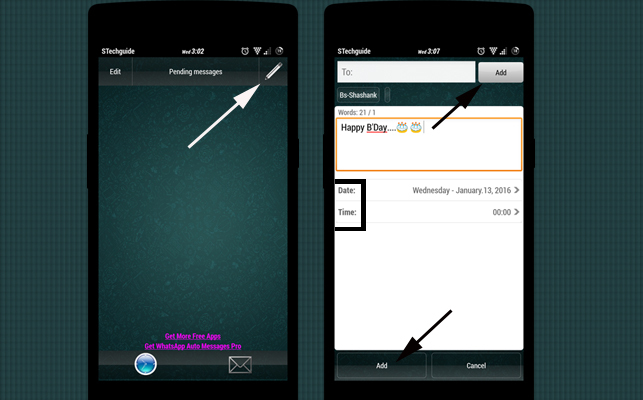 Download Whatsapp message scheduler from above and install it on your Android device. Now on the right corner you see an option to edit, click it and you enter in the editing screen. Add you recipient and Type the message you want to send. Now select the date and Time you want to schedule your message and click Add. That’s all your message has been scheduled. you will get notification when the message has been sent. 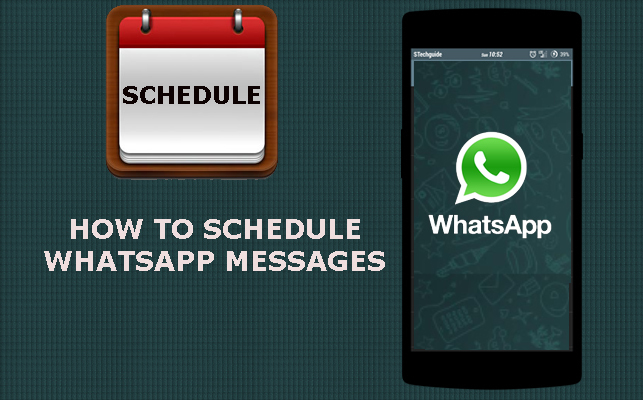 This is the complete guide of how to schedule Whatsapp messages on Android phones with root and without root. 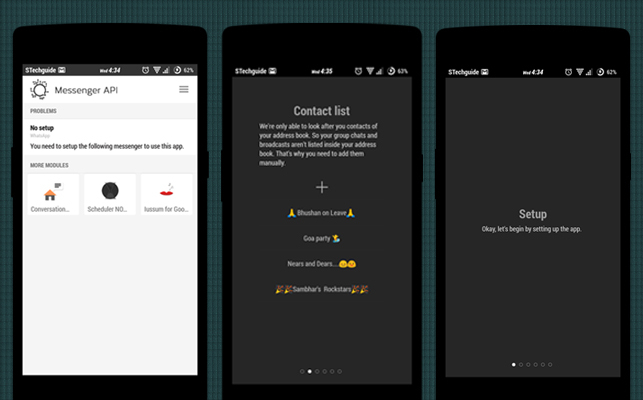 So if you are planning to schedule some messages then go ahead and setup this awesome app. If you have any questions comment below. Nice post but it doesn’t work for non rooted phones.